Text Carl P. Daw, Jr.
Order Conductor's score and parts! Order Conductor's score and parts, PDF download! In some lectionaries, the Feast of the Transfiguration is observed on August 6, the anniversary of the bombing of Hiroshima. Carl Daw's text dramatically juxtaposes New Testament imagery with the brightness of the mushroom cloud, creating a powerful and unforgettable message: "All has changed." 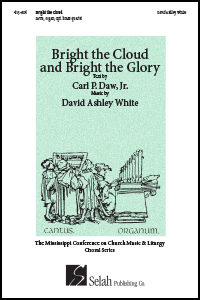 David Ashley White has captured the essence of the text in a strong, striding melody which forms the musical basis of this truly impressive work. splendor too profound for praise. and they would never be the same. knowledge keen but not yet wise. and we shall never be the same. to receive a victor's crown. more than might, wealth, or renown. that we may never be the same. ©1995 Hope Publishing Co., Carol Stream, Ill. 60188 (for permission to reprint this text contact Hope at 800.323.1049-www.hopepublishing.com). All rights reserved. © 2019 Selah Publishing Co., Inc., Pittsburgh, Pa., 15227.